Josey Jewell lines up a tackle Saturday night. Credit: Ron Chenoy, USA TODAY Sports. After one of the possibly best drafts the team history, fans have been anxious to see the future of the Denver Broncos in their first preseason action. On Saturday night, the team hosted the Minnesota Vikings in their first preseason game and those rookies were on display. Following positive training camp reports, it’s become apparent the 2018 draft class will likely be a major part of the team’s upcoming regular season. 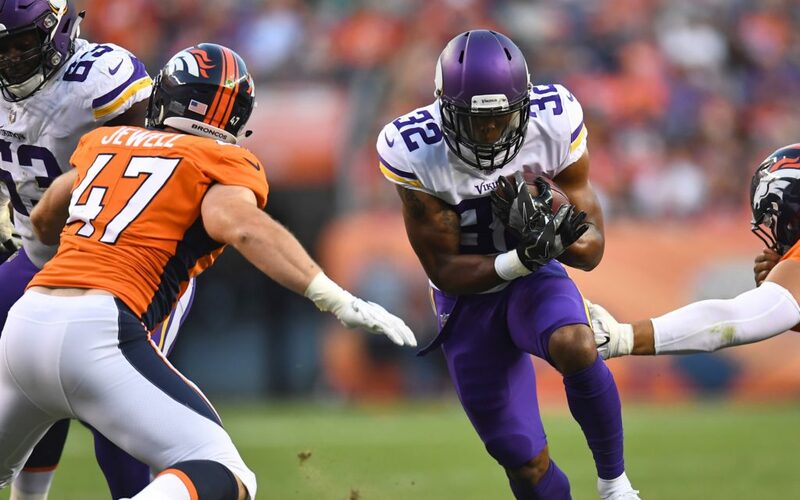 While the Broncos fell to the Vikings 42-28, the team’s rookie class displayed some promising results on the field that could point to a bright future for the Broncos on both sides of the ball. The Broncos No. 5 overall pick Bradley Chubb made his highly-anticipated NFL preseason debut starting at defensive end. The Broncos transitioned between a 4-3 and a 3-4 alignment, which saw Chubb move to the outside linebacker role. Chubb immediately showed why he was deserving of being called the “best defensive player in the draft,” displaying explosiveness and physicality in the pass rush. With the Vikings threatening to score on the Broncos’ goal-line, Chubb saved the would-be touchdown by standing up running back Latavius Murray at the line of scrimmage for no gain. Chubb’s first preseason game was short-lived, as head coach Vance Joseph sent in the second-string defense after two possessions, ending Chubb’s night. Chubb finished with one tackle and one quarterback pressure. Another defensive rookie who shined in the Broncos’ first preseason game was inside linebacker Josey Jewell. Jewell, a fourth round selection out of Iowa, saw extensive playing time while filling in for injured inside linebacker Todd Davis. Jewell displayed the same traits that made him an All-American in college; consistently finding his way to the ball-carrier and seemingly always being involved in a defensive stop. In three quarters of action, Jewell recorded five total tackles (3 solo, 2 assist). Unfortunately, not all of the defensive rookies played particularly well. Third-round rookie Isaac Yiadom had a rough start to his NFL career, surrendering the first Vikings touchdown while getting beat on a slant route by Stefon Diggs. Things didn’t better for Yiadom after that, as all three Vikings quarterbacks found success throwing the ball in Yiadom’s direction. It seems the competition for the No. 3 cornerback position will continue into the preseason, as he battles the injured Tramaine Brock. On the offensive side of the ball, the Broncos might have found their next long-term star at running back. Third-round selection Royce Freeman stated his case to be the starting running back for the Broncos scoring the team’s first touchdown on a 23-yard run in the second quarter. Freeman showed good vision and a quick burst that jump-started the Broncos sluggish offense. Freeman finished the game with 38 yards on four carries and a touchdown. Additionally, at running back, all eyes were on running back Phillip Lindsay, the undrafted University of Colorado star who began making a name for himself after drawing rave reviews in training camp. In a crowded backfield, Lindsay needed to make a statement in his first preseason game, and had his opportunity to do so so by being the first running back on the field after starters Devontae Booker and Freeman. Lindsay saw extensive playing time, particularly in the second half and even scored the go-ahead touchdown on a pass from quarterback Chad Kelly. His performance made a profound case to not only make the team, but to see playing time at running back. Lindsay displayed the same elusiveness and electric playmaking ability that made him a star at CU, exciting fans. Lindsay finished the game with two rushes for seven yards, and led the team in receptions, notching three catches for 40 yards and the aforementioned touchdown. Despite the training camp hype about the rookie wide receiver duo of Courtland Sutton and DaeSean Hamilton, they each had relatively quiet games. Sutton registered only one catch for three yards. The lack of productivity can be attributed to both receivers seeing most of their playing time alongside a struggling Paxton Lynch (6/11, 24 yards and 1 INT). While the first preseason game carries little merit to how well a team will perform in the regular season, it was an encouraging performance from the Broncos rookie class, solidifying the praise they had received during OTAs and training camp. For a team that has not seen its draft picks pan out well over the past couple of seasons, the Broncos are counting on this group of young talent to flourish into serviceable starters for the team, which could start as soon as this season.